World Trade Center 1 is under construction between SW 1st and 2nd Avenues, Salmon and Taylor Streets. WTC3 is a little further along in its construction at far right and land is cleared to begin WTC2 beyond that. Under the billboard in the foreground sat the Old Main Tavern. 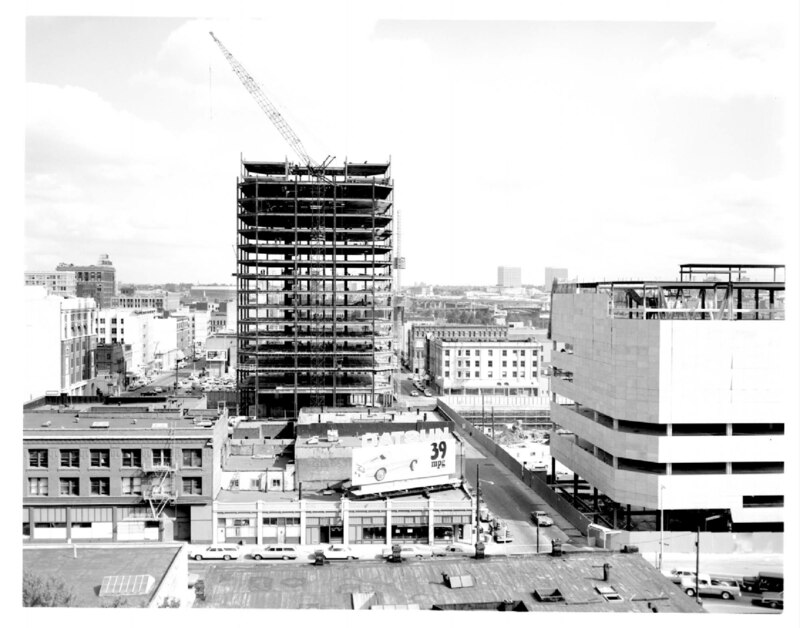 It suffered a fire in October 1977 and the whole block would be demolished to be replaced by One Main Place. Sort of depressing that we were advertising cars that got 39 mpg 37 years ago. Now you have to have a Prius to get that kind of gas mileage. In the next to the last comment (by yours truly) is a link to a color photo (courtesy U of O digital collections) of the Old Main Tavern. Dan also found some other photos of the same area and linked to them in the last comment. I can’t tell from that photo but if that sign was advertising a Datsun B210 those things may have got 39MPG but man those were bad cars.